Two weeks ago I showed you pre- and mid-blocking shots of my Rock Island shawl but it hadn’t dried so I didn’t get to show you any “glamour shots.” Now its off the blocking mats and looking gorgeous. This Jared Flood pattern was first released in April 2011 and I first cast it on in May 2011. Yes, that’s right, it was on the needles for 3 years and 8 months… It’s not that slow it knit, I promise. 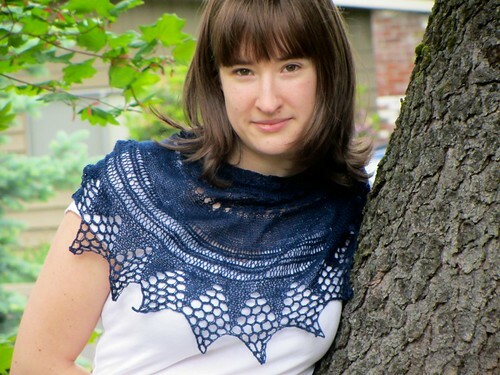 You knit the lace edge first as a long strip then pick up stitches along a long edge and knit the body of the shawl up to the center back incorporating decreases up the center “spine” and at the edges to form the triangle. It’s 72 repeats of the edging before you get to pick up the body of the shawl. 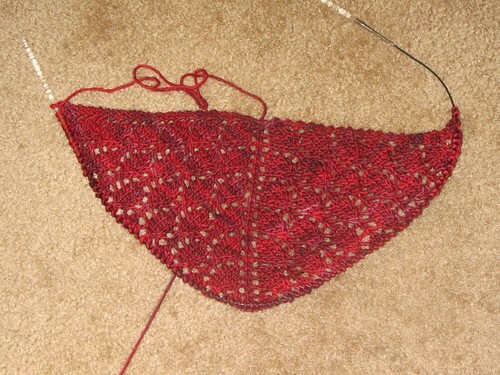 I knit about 20 and then the shawl sat for quite a while. I finally picked it up and decided to finish November of 2014. It didn’t get continuous attention because it’s intricate lace (patterned on both right and wrong sides) and needed lots of focused attention until getting to the garter stitch body. Once I got through the lace and into the garter stitch, this turned into my commuting project and took about 3 weeks of train rides to wrap up. On Ravelry I’ve titled my project “El Diablo” which is what some of the other knitters started lovingly half-lovingly referring to this pattern as. With the lace patterning being executed on both sides a dropped stitch is basically a sanity killer. I used lifelines for every 10 repeats on the edging and had to use them more than once. I used them every 4 rows on the body lace because the rows were so long. Luckily I never had to use one of those. This is definitely in the running for most difficult pattern I’ve ever completed. This aran sweater might be the only other thing that comes close. I’ve mentioned a few times that I’m trying to whittle down my old languishing projects. Putting this one to bed leaves 7 more projects that were cast on pre-2014. Hopefully I can keep up the momentum. Don’t ask about the crochet blanket. I tend to think of myself as a process knitter. I generally pick projects that I want to make, not necessarily projects that I want to have in the end. The one weird exception to this is lace. I covet finish lace objects. Love the intricate feather-light airiness. I just don’t love knitting it. I know exactly why. 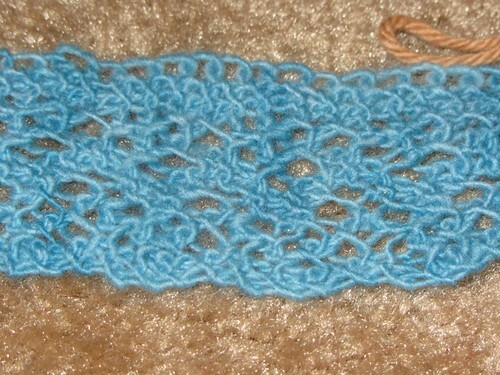 Lace looks like this before you block it. That border is very intricate lace. There are no “rest” rows there are yarn overs and decreases on every row. Drop a stitch in that, and you’re screwed. And yet, it looks incredibly unimpressive. There’s just nothing fun about unblocked lace. I love to stop mid-kint and take a look at what I’ve produced every so often, and with lace, it just never looks like you’re producing something worth all the effort you’ve put in. It’s not until you are completely finished and get a chance to aggressively block your project that you finally see the fruit of your work. I don’t like waiting that long to finally see what I’m getting. I mean, blocking improves everything, but lace doesn’t look like anything before it’s blocked. I need more encouragement than that. And yet, I still find myself casting on lace projects. It generally leads to extremely enthusiastic beginnings when I’m all excited by gorgeous pattern pictures and a freshly wound ball of buttery lace yarn. I also get pretty enthusiastic about the end because I can taste the lovely lace I’m about to see bloom into life with a good block. The middle, frankly, is a slog. Every time I think about a new lace project I go through the same internal debate–do I want to start a project I know will feel like a toil through the long middle? Is the FO worth it, when the process is really what I love about knitting. The answer is generally yes. Life is a mystery. But seriously, look at the blocking photo! How’s the progress on the crochet blanket you ask? Shut up. 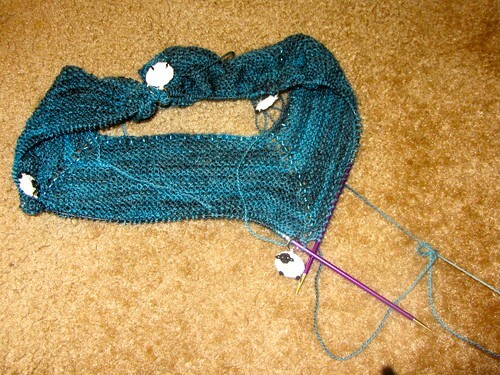 I recently cast off a project that has been on the needles since June of 2010. I think anyone who has been knitting for a while (almost 10 years for me) has these linger projects. Ones that get picked up, a few rows added, then put back down over and over. Mine is Scarf with the No. 20 Edging from “The knitted Lace Pattern Book,” 1850 from the book Victorian Lace Today by Jane Sowerby. It’s a book with extremely beautiful lace based on traditional Victorian patterns. If you’ve ever used Yarnia yarn, you know it’s not actually plied, each of the strands sit next to each other on the cone and the knitting experiences is like holding several strands of yarn together. This makes the risk of splitting higher than usual and and in a lace project where you’re using larger-than-recommended needles it makes for slow going. I’m guessing that’s part of why this kept getting set down–it took a lot of focus, and I just don’t have as much time to dedicate to projects that need constant attention. In the end, it turned out beautiful. My mom claimed it the last time she was up, and it’s a little fancy for my wardrobe so I didn’t object. Every project in this book is gorgeous, so I will probably cast on another soon… and hopefully get it finished with less delay. Cool thing number 1: I made a few small blog improvements since last post. See those pink circles under the “Follow Me” heading over there on the right? Click on any of them to find me on the various sites they represent. See those “share” buttons down at the bottom of the post? Click on any of them to save/share anything from the blog. To add those two things took me about 3 hours… html coder-extraordinaire I am not. Each < and / had to be checked and rechecked. I’m pretty proud of my meager victory. Cool thing number 2: I finished Pear Drop. I love it. The pattern is from Ysolda Teague’s book Saturday Treat which has some pretty freaking adorable accessories in it. To knit this pattern, you sart with the edging and knit it side to side, then you pick up along the top of the edging and knit the body of the shawl up decreasing to make the crescent shape. I used Fyberspates Scrumptious Lace yarn in colorway Midnight. The yarn is 50% silk 50% merino–in other words, absolute heaven. The silk gives it beautiful sheen and drape and the merino ensure that it’s still warm and soft. I “split” the skein with a friend that I knit with–gave her half the price of the skein for half of the yardage–because the shawl only needs about 275 yards for the small size and a full skein is over 1000 yards. I weighed my leftovers when I got done and I have 25.6 grams left, so theoretically I could just eek out a second one if I wanted. 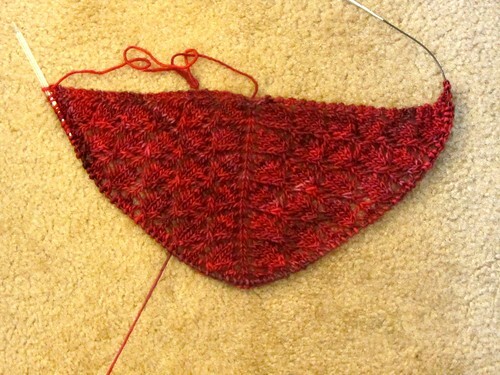 Cool thing number 3: Finishing the Pear Drop means that I now ONLY have 10 projects currently on the needles. I know that that sounds like tons to some people but I haven’t had so few in a long time. My (probably unreachable) goal is to get it down to five and keep it there. 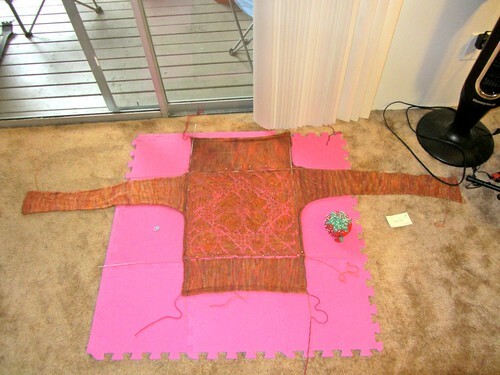 Cool thing number 4: Everyone else’s finished projects linked up over at Tami’s Amis. May marks the beginning of the second year of the monthly knit-a-longs at my LYS For Yarn’s Sake. Each month the shop picks a project and hosts some time once a week to work on it, get help, trade advice and modifications–it’s lovely. I haven’t participated in all of them but have done quite a few. June was not a month I participated. 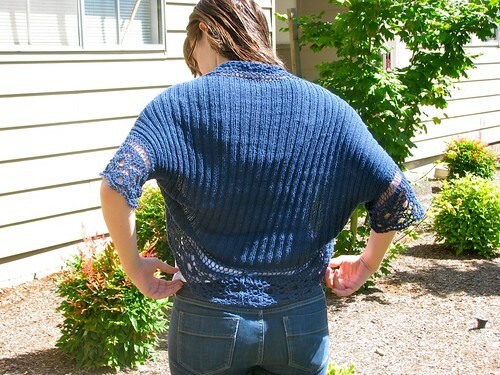 The project was the Radian Yoke sweater by Wendy Barnard. I love this cute summer tee and plan to make it eventually, I just didn’t have the time or (if you can believe it) the right yarn. July and August were devoted to the same project. The Lissajous Socks by Cookie A. I’m still actively working on these. Actually, “actively” might be a bit strong. “Reluctantly” is more accurate. 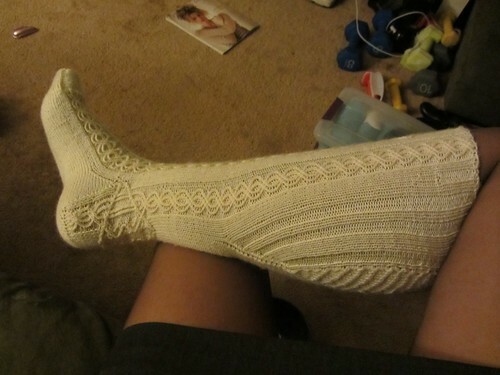 Now that the knit-a-long is well over I’ve only been working on them for an hour a week at sock hour at the yarn shop. I have one complete and I’m almost through the big chart for the second one. Turns out, slow and steady does NOT win the race. September was also a month I participated. And also a project I have yet to finish. 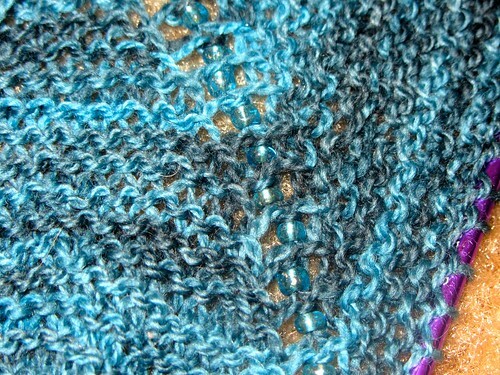 I’m also still working on my Dahlia Cardigan by Heather Zoppetti. This one is so close to being done I can taste it. All I have left is the left front of the cardigan. I don’t have a photo since finishing the right front, but I did snap one after I had finished the back and sleeves. Hopefully I will be showing this off as an FO soon. October was another intense lace project–the True Love Stole by Wendy Johnson. This was a project that a lot of the knitters had a hard time getting into (the chart is a 45-row repeat!) and I doubt I’ll ever really sit down to make this one. I do think it’s lovely though–just too fiddly for me currently. Maybe someday I’ll want something really fiddly and I’ll come back to this one. 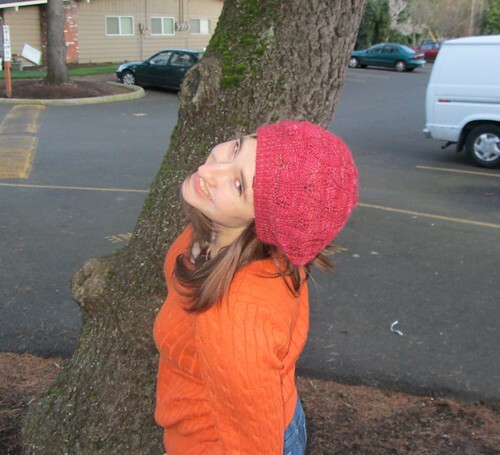 November and December were devoted to the Larch Cardigan by Amy Christoffers. I didn’t get in on this project either because finals were just heating up for fall term and I didn’t have the time. January was scheduled as a “catch-up” month and I spent some extra quality time with Dahlia–after you finish the lace back it’s a never ending sea of stockinette. February was the first project that I actually finished (don’t judge!) and only because it was a hat. The Rustling Leaves Beret by Alana Dakos was a nice quick knit and allowed me to use up some silk-alpaca handspun I was itching to find a project for. March and April was another two-month project with a twist. We got to choose to either make the Gnarled Oak Cardigan or the Wildflower Cardigan both also by Alana Dakos. Some crazy women decided to knit both since we had two months. In two months I didn’t even manage to finish the back piece of the Wildflower. I don’t have a picture of my progress yet since right now it’s just a big slab of stockinette. All of the fun is on the front of this one. When I get something more interesting than a rectangle of stockinette I’ll show it off. 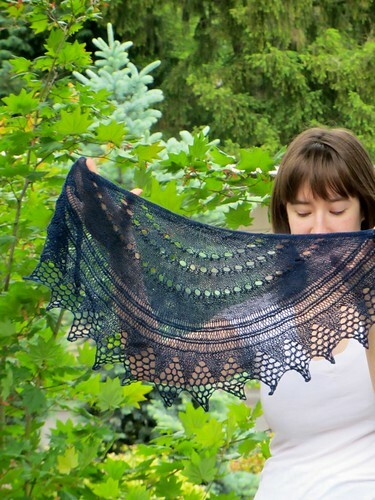 Now, year two is kicking off with a beautiful little shawlette from Ysolda Teague–the Pear Drop. Do you think I will be able to finish within the month? This little bit of ugly is all I have so far of Jared Flood’s Rock Island. The edging is knit in a long thin strip, then the body of the shawl is picked up and knit in ever decreasing rows toward the center. I’ve knit lace before, so I know that it sort of looks like hell until you finish and block it, but this has a particularly scrubby look. It’s sort of making it not fun to work on because it feels like all I’m producing is a hot little mess. The finished versions on Ravelry are extremely impressive (the ones I don’t like are almost all either because of bad yarn choice or bad blocking.) Since I love this yarn and I know it’s necessary to block the snot out of lace I think I’m on a path that will eventually pay off. I started this in May just after school got out, but haven’t really worked on it at all since school started. I’m hoping to pick it up again, but hoping doesn’t put stitches on the needles. 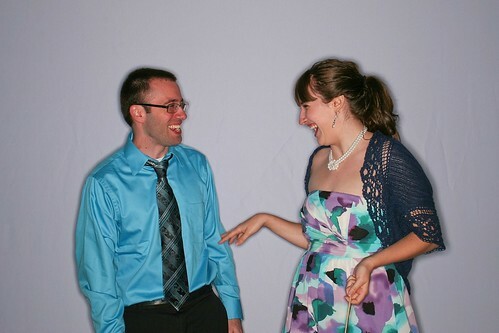 Oh Hi blog. How are you? It’s been a while… I started a new Job at the beginning of June and I can’t believe I’ve been there a month now. waking up at 6:45 every morning is not fun, but the job is good and the work can be fun. The real reason I’ve been derelict in my posting is because I moved in the last two weeks of June and I’m still trying to settle into my new place. The packing up and getting out of the old place wasn’t so bad, I had lots of help from Ryan and Adam. It’s the unpacking and trying to get the new place set back up that’s killing me. Have to find a new place for everything, have to figure out how this place wants to be set up, ugh. The pattern is exceedingly boring to knit. First you knit a giant block of 2×2 ribbing, 21″ worth of ribbing to be exact. 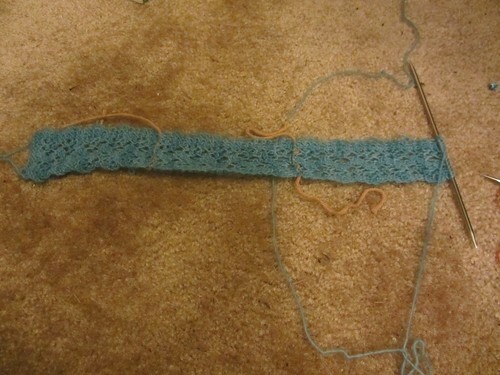 Then you knit three strips of lace, two to go around the sleeves and one to go around the body. The strips are about 20 stitches wide. The lace is not charted, so you either have to chart it yourself (which I did after the first repeat) or try to follow written lace instructions. Then you fold the body and add a little seam. Then you sew the strips of lace around the edges. It’s a lot of finishing work. I do like the result though. 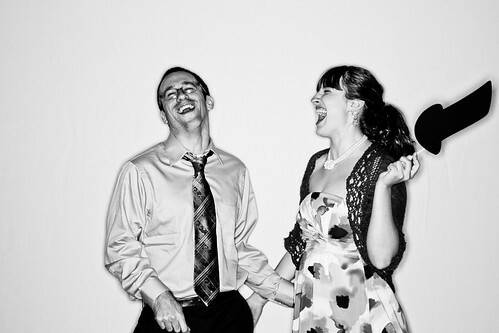 At the wedding there was a sort of photo booth set up and everyone there got the password to access the photos. The company is located in WA but I guess they do shoots in Portland too. I’m holding a cardboard cut out top hat and Ryan is holding cardboard bright red lips. The yarn is Elsebeth Lavold Hempathy. 41% Cotton, 34% Hemp, and 25% Modal. I love the finished project, but this yarn is hell to work with. It’s so rough on your hands, there is no give at all, it’s not at all soft before it’s washed. After it’s washed it blooms like mad and becomes super drape-y and soft. I focused my knitting attention on this pretty exclusively to get it done in time for the wedding and now I’m feeling the backlash in the form of some major knitting ADD. I can’t settle down to any one project I do a few stitches on one a few on another. I’m super tempted to start something new but I’m trying to finish my old project. I have a few that have been lingering for far too long. I’m working on the finish two to start one system. Now that this is finished I have to finish one more before I can cast something else on.